Digital printing is very price competitive at quantities up to around 3,000. Call us today for an estimate on your job. 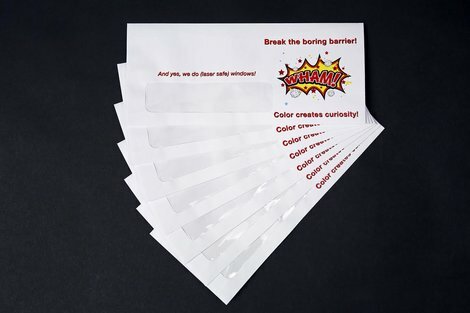 Vibrant Color for Short Run Envelope Jobs! Elite Envelope's latest acquisition is something you may want to know more about. 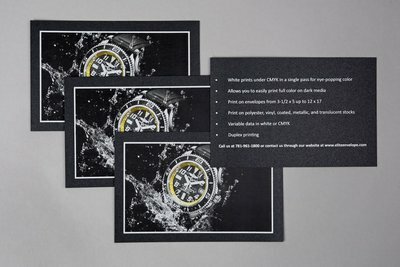 It's an OKI Data 5 color perfecting unit (CMYK & White) and represents the latest technology in digital envelope printing. One of the sweet features of our new press is the ability to print in white ink on a dark background. 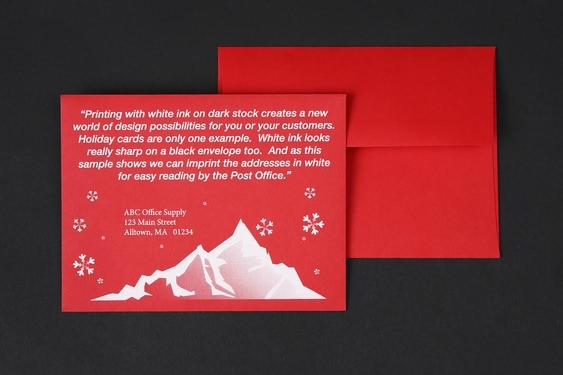 Eye-catching contrast can set your message apart! Lays down white under CMYK for eye-popping contrast. Also prints addresses and other variable info in white for major impact. 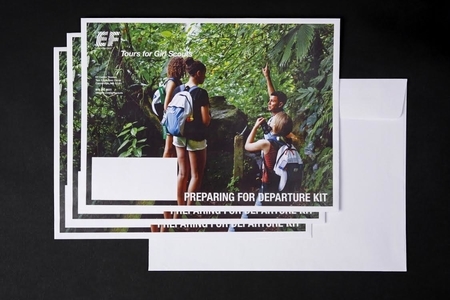 We can print anything from 3 1/2 x 5 up to 12 x 17 - booklets, open ends, A sizes, squares - you name it. We can print on polyester, vinyl, coated, metallic and translucent stock. Because we are a converter as well as a printer of envelopes, we can take flat sheets printed in full coverage and convert them to beautifully printed envelopes even at minimum quantities. Special heat resistant window patch material allows for the same hot colors on window envelopes of all sizes.